Big Magic Mirror, Selfie Photo Booth & Ads kiosk Words like charming, cozy, classic come to mind when describing our ICE MAGIC MIRROR. State-of-the-art technology and unique features will have everyone looking their very best. Modern, spacious, eye-catching and red-carpet experience without the dirty rug! Personalize the background, choose from multiple layouts and enjoy frame-filling photos of both small and large groups. The Ability to easily fit Small & Large Groups Our ICE MAGIC MIRROR can fit to both small and large groups. Unlimited Photos + Lightning Speed! Every Rental included with unlimited photos with Lightning Speed printing. No long lines and more photo memories! FREE On-site Reprints Avoid the who-gets-this-photo fight! Guests can reprint or even text their favourite photos instantly. Quality Way beyond Megapixels! Real-time image enhancement creates images of the highest quality. Our software analyzes and adjusts every image to ensure proper color rendition, contrast, exposure and sharpness. An On-Site Attendant This trained customer service guru is included with every rental, will help your guests and make your photo guest book look even better! Super Tones, Photo Filters! Why choose between Color and Black & White? Unleash the creativity and watch guests take more photos with filters of Black & White, Color and Sepia. Free Downloads. View, download and share photos with a password protected gallery that only you and your guests can access. Real-Time Social Media Integration Our ICE MAGIC MIRROR lets guests INSTANTLY share their photos in Social Media, so that they can be with the world! 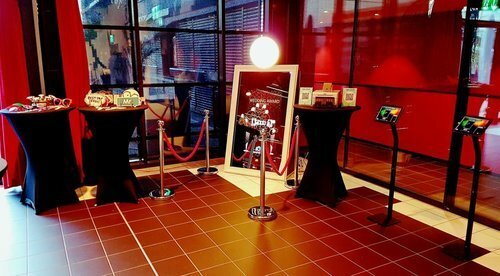 Personalization / Branding Display your image and message both on the ICE MAGIC MIRROR and on every printed photo. Custom Backgrounds Choose from a variety of in-house backgrounds or design your own! Prop kits & More Enjoy with every prop kit available readily to share your mood! Ice Digitek India Private Limited was commenced in the year 1999, with an affirmation to manufacturing a high-quality range of Magic Mirror and Retail Kiosk. Offered products range consists of Ice Big Magic Mirror, Big Selfie Photo Booth, and Big Magic Mirror Photo Booth and much more. The entire range is designed and developed as per the set quality norms and values of the industry. Our range of products is renowned for precision attributes like longer life, lightweight, simple design, easy to use and low cost.